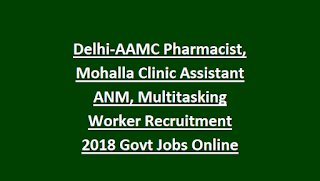 apply online for this AAMC Pharmacist, ANM Mohalla Clinic Assistant jobs is www.aamc2018.co.in. Candidates selection will be based on written exam and/or interview for this AAMC recruitment 2018. There are total 600 vacancies in this MAMC AAMC recruitment 2018. 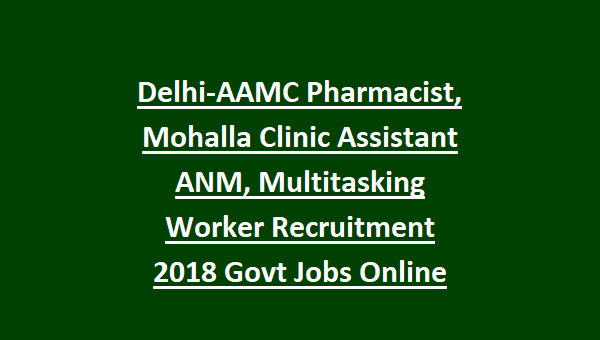 Post wise vacancies, qualifications, pay scale, selection process, online application procedure and other details of AAMC Pharmacist, ANM, Multitasking Worker jobs recruitment 2018 is given below. There are total 600 posts in this AAMC recruitment 2018. 1. Pharmacist, ANM Mohalla clinic Assistant Posts age limits are 20-50 years. 1. Pharmacist Jobs-Degree or Diploma in Pharmacy is required and Must have registered with Delhi Pharma council. 3. Multitasking Worker-10th pass and must have First Aid Certificate trained from St John Ambulance Brigade. For all the posts salary will be Rs.25000-Rs.30000 per month. Candidates selection for this Aam Aadmi Mohalla Clinics recruitment will be based on written exam and/or interview. Those who are interested and having the required qualifications which are mentioned above, they can apply online for this AAMC Pharmacist, ANM, Worker jobs on or before 21-10-2018. Official website to apply online is www.aamc2018.co.in.